If you are on the Atkins Diet, England is not the place for you. It is my theory that dreary weather drives people to crave carbohydrates, and I blame the fact that 2012 was the wettest (i.e. greyest and gloomiest) year on record for the fact that I am now participating in the gym’s “Biggest Loser” weight loss challenge. The Brits do comfort food really well—porridge, crumpets, bacon baps, pasties, jacket potatoes with all kinds of toppings, chips (big, fat hand-cut French fries—the ones made from Maris Piper potatoes are the best), mac and cheese (with a side of chips), and oh, yes, pies (think potpie, not apple pie–with a side of chips). 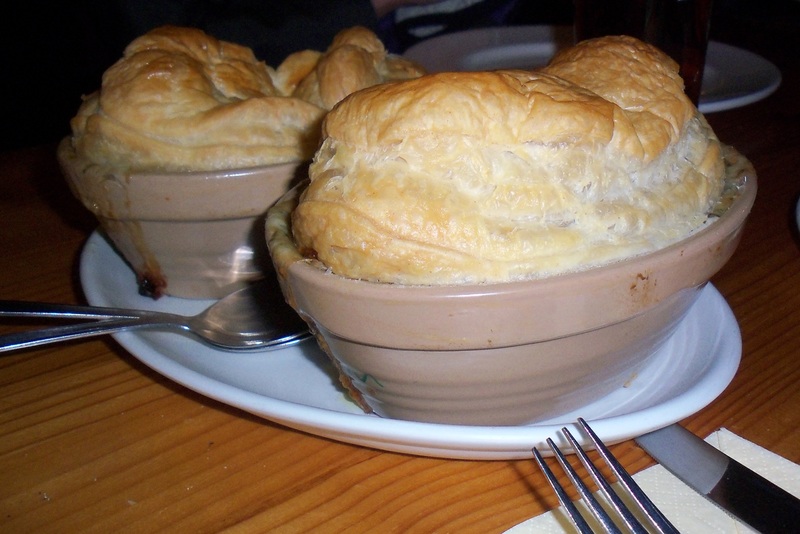 You haven’t had a British pie until you’ve been to Puddingface at the Crown & Tuns in Deddington. The pies are huge and homemade, so the selection changes daily based on what’s available from the local suppliers. The menu is listed on a chalkboard near the bar, and it’s often difficult to choose just one from the range of ten to fifteen pies. Is it a sausage and bacon kind of night, or perhaps turkey with sage stuffing, or traditional English steak and kidney (uh, no thanks)? The chef will happily cater to vegetarians, but Atkins dieters should just stay home—there’s really no lesser of two evils when you have to choose between short crust or puff pastry. Carbophobics also have to make a dreadful decision on side dishes between a basket of chips or a crock of mashed potatoes. That’s the spirit! You will never be able to get that deliciousness here!